This is the second Spanish edition of A Thief of Time published in April of 1989 by Versal S.A. in Barcelona, Spain. This is the Crimen & CIA edition of the book, which seems to be a crime novel version of the book. 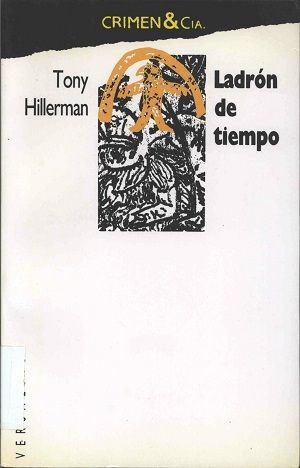 The text was translated from Tony Hillerman's original English to Spanish by Marco-Aurelio Galmarini and the cover design is by Joan Batallé. Format: Paperback, 20.5 x 13 cm. Binding: Full-colored paper covers with the number 20, title, author, and publisher printed vertically on the spine.